MONROVIA, 19 January 2010 (IRIN) – Farmers are turning to urban gardens as a way to boost food security in Liberia’s Montserrado County, where just one percent of residents grow their own produce today compared to 70 percent before the war. Some 40 percent of Liberia’s population lives in the capital, Monrovia – located in Montserrado – after years of fighting sparked rural communities to move to the city. Many new arrivals had no access to land and have crowded into slums. Over half of Monrovia’s residents live on less than US$1 a day, according to the World Bank. 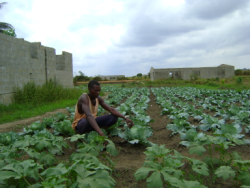 The Food and Agriculture Organization (FAO) is targeting 5,000 urban residents of Montserrado, Bomi, Grand Bassa, Bong and Margibi counties, to encourage them to start market gardens or increase the amount of fruit and vegetables they grow on their farms. Participants had to have access to tools and some land. The aim is to improve food security and nutritional status while boosting incomes, said project coordinator Albert Kpassawah. Participants told IRIN they plant hot peppers, cabbage, calla, tomatoes, onions, beans and ground nuts. Health and nutrition experts in Liberia say increasing fruit, vegetables and protein in people’s diets is vital to reducing chronic malnutrition, which currently affects 45 percent of under-fives nationwide. When he lost his garden his family found it hard to eat, he said. Now he grows enough to sell part of his produce. “Sometimes people come here to purchase huge quantities. I pay for the school fees with the money I earn,” Rogers told IRIN. Paul Tah, father of six, had never farmed before he got involved in the FAO project. “I got interested in this project because of the lack of jobs in this country,” he told IRIN. He now makes $200 each season from selling peppers. FAO assists primarily by providing seeds and training in techniques such as conserving rainwater and composting. The organization does not provide fertilizer, insecticides or tools – a concern to some participants. “You cannot grow cabbage without insecticide. It doesn’t work,” Anthony Nackers told IRIN. Vermin, insects and poor storage destroy 60 percent of Liberia’s annual harvest, according to FAO. And many of the most vulnerable city-dwellers – those with no access to land – cannot participate at all, FAO’s Kpassawah pointed out. But he said he hopes the project’s benefits will spread beyond immediate participants, since all who take part are encouraged to pass on their training to relatives, neighbours and friends. And there is ample scope to expand techniques learned from cities to rural areas, he pointed out. Just one-third of Liberia’s 660,000 fertile hectares are being cultivated, according to the Ministry of Agriculture. SINGAPORE — Asia’s urban poor are worst-hit by spiking food prices, according to a report released Tuesday by a regional think tank which tipped rising volatility in commodity prices. Impoverished families in the region’s teeming cities are more vulnerable than rural folk to swings in food costs, according to the Pacific Economic Cooperation Council (PECC). “Food price increases’ greatest impact is on the urban poor who are more dependent on a money-based economy and spend a large share of the household budget on food,” said Walter Armbruster from the PECC taskforce which authored the report. The report, released at the Asia-Pacific Economic Cooperation (APEC) forum in Singapore, said that food price volatility was set to worsen as trade in commodities became more interlinked with other markets. “Real agricultural prices increased in the 2000s, as they became more closely linked to non-agricultural commodity and energy prices. Some of these price increases — such as fertilizer and transportation costs — changed the cost structure of agriculture,” he said. Protectionist policies by major agricultural producers coupled with “the psychology of scarcity and propensity to hoard” were other factors behind volatility, Armbruster said. “Policy intervention played a significant role in raising agricultural commodity prices, especially in the case of rice,” he said. Describing swings in rice prices as “the single most important phenomena affecting the region’s food system in recent years,” Armbruster said that a major factor was slim trading volumes in the grain. “An important lesson from this volatility was that the rice market intervention, if left unchecked, can be more destructive than economic events,” he said. Commodities prices soared before the global downturn struck last year, causing serious concerns over food prices and food security. The UN food agency said this week that although prices have fallen significantly since their peaks a couple of years ago, wheat and maize prices are rising and rice export prices are still way above pre-crisis levels. Armbruster urged regional nations to adhere to the APEC Open Food System of liberalising trade and developing rural regions in agricultural economies in order to cushion the impact of food price volatility. “We may be entering a higher volatility future in commodities prices, but there are some things that can offset that volatility,” he said.